Sahoo, S., Mishra, S., Nayak, A., Kanta Patel, S., Kumar Panda, P., Kanta Dash, S., Ellaiah, P. (2009). Isolation, Screening and Characterization of Hyaluronidase Producing Bacteria. Iranian Journal of Pharmaceutical Sciences, 5(2), 95-102. Sabuj Sahoo; Satyaranjan Mishra; Anindita Nayak; Sashi Kanta Patel; Prasana Kumar Panda; Sashi Kanta Dash; Poluri Ellaiah. "Isolation, Screening and Characterization of Hyaluronidase Producing Bacteria". 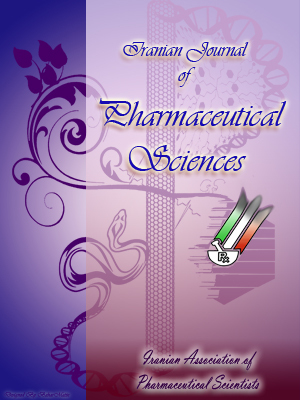 Iranian Journal of Pharmaceutical Sciences, 5, 2, 2009, 95-102. Sahoo, S., Mishra, S., Nayak, A., Kanta Patel, S., Kumar Panda, P., Kanta Dash, S., Ellaiah, P. (2009). 'Isolation, Screening and Characterization of Hyaluronidase Producing Bacteria', Iranian Journal of Pharmaceutical Sciences, 5(2), pp. 95-102. Sahoo, S., Mishra, S., Nayak, A., Kanta Patel, S., Kumar Panda, P., Kanta Dash, S., Ellaiah, P. Isolation, Screening and Characterization of Hyaluronidase Producing Bacteria. Iranian Journal of Pharmaceutical Sciences, 2009; 5(2): 95-102. Hyaluronidase has a panoramic use in biotechnology processes and therapy due to its therapeutic, pathophysiological, physiological and biological importance. Since much of the preparations of hyaluronidases are from animal source (bovine and ovine testicular sources) with limited sources of microbial origin, that prompted the authors to screen and isolate a new promising bacterial strain with higher yield followed by its characterization employing detailed taxonomic studies. The newly isolated strain was identified based upon their micro- and macro-morphological, cultural, physiological and biochemical parameters. Twenty isolates from different pathological samples were primarily selected and further screened for their hyaluronidase producing capabilities by measuring reduction in turbidity and hydrolyzed zone of substrate hyaluronic acid. Four isolates showing marked reduction in turbidity (A600 nm) and hydrolyzed zones were selected and subjected to secondary screening by shake flask fermentation. Isolate SII9 (Dental caries specimen) exhibited maximum hyaluronidase activity (117 U/ml) when compared to the reference Streptococcus mitis MTCC*2695 (106 U/ml). A close scrutiny of the literature revealed that the characteristics of our isolate SII9 are mostly identical to S. equi subsp. equisimilis with few differences and thus designated as S. equi SED 9. Hyaluronidase (hyase) is a general term initially introduced by Karl Meyer in 1940 to describe enzymes that are able to break down primarily hyaluronic acid (HA) . The degradation of HA produces a disaccharide product. The enzyme acts as an adjuvant, accelerate and increase absorption and dispersion of injected drugs, e.g. antibiotics, to promote resorption of excess fluids and improve the effectiveness of local anaesthesia and to diminish pain due to subcutaneous or intramuscular injection of fluids , for hypo-dermoclysis and as an adjunct in subcutaneous urography for improving resorption of radiopaque agents . The enzyme is used as a spreading factor in several medical fields viz. orthopaedia, surgery, ophthalmology , dermatology, dentistry , oncology , gynecology  and internal medicine . Bacterial hyaluronate lyases were reported to be virulence factors that facilitate the spreading of bacteria in host tissues by degradation of hyaluronan . Hyase facilitates diffusion of antiviral drugs, dyes and toxins . Based upon the medical, physiological, biological and commercial importance of hyases, authors have screened and isolated a newly promising bacterial strain with higher yield followed by its characteri-zation employing detailed taxonomic studies . Turbidity reduction assay [12, 13] method and determination of hydrolyzed zone of HA were employed for isolation and screening of hyase producing microorganisms. The pathological specimens were collected from different pathological laboratories at Bhubaneswar, Orissa, India. The pathological samples were collected and transferred into sterile screw capped culture tubes containing Stuart's transport medium . Each specimen collected (swab, sputum and blood) was immediately spread on sterile blood agar plates containing an antifungal agent (fluconazole 25 μ g/ml) to prevent fungal contamination and incubated at 37 °C for 24 h. A total of 20 isolates selected on the basis of colony size, shape and extent of hemolysis were screened for hyase activity. The isolates exhibiting good hemolytic zones were aseptically transferred into different 100 ml EM flasks containing 25 ml sterile nutrient broth and incubated at 37 °C for 24 h. Five ml culture broth was then withdrawn, centrifuged at 8000 rpm for 20 min. at 4 °C and clear supernatant collected was subjected to turbidity reduction assay [12, 13] (A600 nm by UV-visible spectrophotometer; Systronics, Model-118) and determination of zone of hydrolysis. The four isolates showing good hyase production were further screened along with reference strain Streptococcus mitis MTCC*2695 (IMTECH, Culture Collection and Gene Bank, Chandigarh, India) by shake flask fermentation method. The selected isolates were sub-cultured onto nutrient agar slants, incubated at 37 °C for 24 h. The growth contents of each slant was transferred into 50 ml of nutrient broth in 250 ml Erlenmeyer flask. The flasks were incubated at 37 °C for 48 h on rotary shaker (Ilshin Lab Co., Korea, Model BBT-1) (150 rpm). The fermentation broth of each flask was centrifuged at 4 °C (8000 rpm) and the clear supernatant was used for the enzyme assay. The experiments were conducted in triplicate and the average values were taken into consideration. The results are recorded in Table 2. Hyaluronidase activity was measured spec-trophotometrically by turbidity reduction assay using HA sodium salt (Sigma Aldrich, USA) as a substrate. The enzymatic assay is based on Dorfmans method  in which the enzymatic reduction in turbidity, resulting when 1 ml of HA at 70 μg/ml was incubated with 1 ml of enzyme sample in the presence of 0.05 M sodium phosphate buffer with 0.05 M NaCl (pH 7.0). After incubation of the mixture for 30 min., 2.5 ml of acidified protein solution (1% w/v) bovine serum albumin fraction-V (BSA) in 0.5 M sodium acetate buffer, (pH 3.1) was added and incubated at 37 ºC for 10 min. and reduction in turbidity was read by measuring the absorbance at 600 nm. One unit of enzyme activity was defined as the amount of enzyme that causes a reduction in turbidity, measured spectropho-tometrically at 600 nm (A600) in 30 min. at 37 ºC, at pH 7.0 under specified assay conditions similar to that caused by one unit of an international standard. Table 1. Screening of selected isolates for their hyaluronidase production. T*-Reduction in turbidity of broth cultures after 30 min. at 37 °C (A600 nm) (Uninoculated culture broth as blank). -Increase in turbidity (A600 nm) after 30 min. at 37 °C. To one ml of substrate [containing 0.25 ml (0.04 %) hyaluronic acid, 0.5 ml distilled water and 0.25 ml of acidified bovine serum albumin (BSA) fraction V (1% w/v) in 0.5 M sodium acetate buffer (pH 3.1)] 0.5 ml of the supernatant (diluted 1:2 in saline) of an 18-24 h broth culture of isolated microorganisms was added, mixed and incubated at 37 °C for 30 min. At the end of incubation time the tubes were cooled in ice bath. To the above mixture 0.1 ml of acetic acid (2 N) was added to precipitate the remaining HA [12, 13]. Tubes containing sterile broth or broth from inactive cultures became turbid while tube containing broth from hyaluronidase producing organism remained clear on addition of the acid. The isolates exhibiting reduction in turbidity is given in Table 1. Each isolate from slant was transferred into conical flask containing 25 ml sterile nutrient broth, incubated at 37 °C for 24 h. Five ml broth was then drawn, centrifuged at 8000 rpm for 20 min. at 4 °C and clear supernatant was collected. Then 25 μl of clear supernatant of each selected (20) isolates were aseptically added into sterile wells of 20 different molten nutrient agar plates containing 1 ml of substrate hyaluronic acid at a concentration of 10 mg/ml. The plates were then incubated at 37 °C for 24 h. The hydrolyzed zone (diameter in mm) of isolates was recorded and is given in Table 1. Thus four isolates showing good hydrolyzed zone were subjected for secondary screening. The isolate showing maximum hyase activity was subjected for identification following detailed taxonomic studies . Table 2. Hyaluronidase production of selected isolates by shake flask method. The micromorphology studies include the shape of the cells, formation of spores, test for motility and gram staining were done. The cultural characters were studied by inoculating the organisms in different media viz. nutrient agar medium, blood agar medium, trypticase soy agar medium, Streptococcus selective agar medium and recording the growth pattern. The physiological and biochemical tests [11, 16, 17] were carried out by inoculating the isolate into the prescribed media. The tests included growth in air, growth under anaerobic condition, growth at different temperatures, growth at pH 9.6 (pH tolerance), sodium chloride tolerance, bile esculin agar, optocin test, alpha haemolysis, beta haemolysis, arginine dihydrolase test, decarboxylase test (Moeller's method), carbohydrate metabolism (acid-gas production) test, ONPG, lysine decarboxylase, ornithine decarboxylase, phenylalanine deamination, methyl red, indole, malonate, hydrogen sulphide production test, b-galactosidase production test, urease test, indole production test, nitrate reduction test, citrate utilization test, test for acid from esculin, arabinose, xylose, adonitol, rhamnose, cellobiose, melibiose, saccharose, raffinose, trehalose, glucose, lactose and Voges-Proskauer (acetoin production) test (VP) for identification of Streptococcus species. The strains SII9 (0.324 OD, 38 mm) followed by SI7 (0.239 OD, 36 mm), SIV19 (0.173 OD, 29 mm) and SIII13 (0.164 OD, 22 mm) showed highest reduction in turbidity (A600 nm) and hydrolyzed zone, respectively, were selected for secondary screening by shake flask fermentation method. Four promising isolates which showed good hyase activity were further screened for their enzymatic activity by shake flask method and the increase in enzyme yield was compared to the reference strain S. mitis MTCC*2695. The data recorded in Table 2, indicated that isolate SII9 (Dental caries specimen (patient with bleeding gums and inflammation) from P.G. Dept. Microbiology, OUAT, Bhubaneswar) exhibited maximum hyase activity (117 U/ml) while the reference S. mitis MTCC*2695 exhibited (106 U/ml) after 48 h. The promising isolate SII9 (117 U/ml) was subjected to detailed taxonomic studies. The morphological and cultural charac-teristics of the isolate SII 9 are appended herewith. The isolate grew as small spheres or ovoids, occuring in pairs or chains. It was nonmotile, nonsporing and gram positive. The growth of the isolate was restricted at 10 ºC while growth observed at 45 ºC (Optimum 37 ºC). The isolate showed no growth at pH 9.6 and 6.5% sodium chloride. An abundant, smooth, scanty circular, semitransparent growth was observed on nutrient agar medium. In case of nutrient broth, moderate turbid growth was observed. Results of the biochemical studies revealed that the isolate SII9 utilized different carbon sources and showed acid and gas production as indicated in Table 3. The isolate SII9 also utilized inulin, ribose, salicin, trehalose, glucose, sucrose and malonate and produced acid while lactose, mannitol, raffinose, sorbitol, arabinose, xylose, adonitol, rhamnose, cellobiose, mellibiose and saccharose showed no acid production. The isolate utilized arginine, lysine and ornithine as nitrogen sources. The strain could reduce nitrate and also utilized citrate, glucose, lactose, trehalose and malonate during its growth. The isolate was H2S, ONPG, indole, esculine and VP negative. The isolate did not show production of urease, phenylalanine deamination, b-galactosidase as indicated in Table 3. From the above morphological, cultural and biochemical tests, it is proposed that our isolate SII9 can be characterized as a strain of S. equi with few characters differentiated from S. equi subsp. equisimilis and thus it was designated as S. equi SED 9. Table 3. Physiological and biochemical tests of the isolate SII9. The isolated strain SII9 showed good hyase producing activity in comparison to the reference strain S. mitis MTCC*2695. Similar results for screening of hyase producing isolates employing turbidity reduction assay were reported by many workers. McClean et al. (1943) reported that Clostridium perfringens growing in tissues produced hyase employong turbidity reduction assay . Group B Streptococci with good hyase activity was isolated by many workers [12, 19, 20]. Some workers also reported the production of hyaluronidase (hyaluronate lyase) by Corynebacterium acnes [21, 22]. A detailed survey of literature indicated that the characteristics of our isolate SII9 is mostly related to S. equi subsp. equisimilis . A detailed comparative study was done employing our isolate SII9 to that of reported characteristics of S. equi subsp. equisimilis. A detailed comparison was done to establish the novelty of our isolate. There are a large number of similarities of our isolate with S. equi subsp. equisimilis . But some significant qualitative and quantitative differences could also be observed. Our isolate SII9 differs from S. equi. Our isolate SII9 showed growth at 45 ºC while S. equi showed no growth. Carbohydrate metabolism pattern of our isolate SII9 indicated utilization of inulin and salicin and produced acid and gas while it showed negative results with lactose. The utilization of salicin was not determined for S. equi and only 21-79% strains are lactose positive. The reported strain S. equi could not ferment inulin. The other physiological and biochemical parameters when compared were found to be similar to that of our isolate. The future studies are aimed at the optimization of growth conditions of the isolate by selecting a suitable production medium along with its bioparametric studies including nutritional and physical parameters, perform strain improvement studies and then subjected to purification and characteriza-tion of the enzyme from the newly isolated strain. The authors are thankful to A.I.C.T.E. for sanction of RPS project to one of the author Prof. P.K. Panda, the H.O.D., P.G. Department of Microbiology and H.O.D., Agricultural Biotechnology, CPGS, Orissa University of Agriculture and Technology, Bhubaneswar, Orissa, India, for extending research and infrastructure facilities to carry out microbial screening. Rees MD, McNiven TN, Daviies MJ. Degradation of extracellular matrix and its components by hypobromous acid. Biochem J 2007; 401: 587-90. Csoka AB, Frost GI, Wong T, Stern R. Purification and microsequencing of hyaluronidase isozymes from human urine. FEBS Lett 1997; 417: 307-11. Law RO, Rowen D. Role of hyaluronidase on urinary and renal medullary composition following anti diuretic stimulus in the rat. J Physiol 1981; 311: 341-5. Meyer K, Palmer JW. The polysaccharide of the vitreous humor. J Biol Chem 1934; 107: 629-32. Tam YC, Chan ECS. Purification and character-ization of hyaluronidase from oral Peptostreptococcus species. Infect Immun 1985; 47: 508-12. Muckenschnabel I, Bernhardt G, Spruss T, Buschauer A. Pharmacokinetics and tissue distribution of bovine testicular hyaluronidase and vinblastine in mice: An attempt to optimize the mode of adjuvant hyaluronidase administration in cancer chemotherapy. Cancer Lett 1998; 131: 71-4. Farr C, Menzel J, Seeberger J, Schweigle B. Clinical pharmacology and possible applications of hyaluronidase with reference to hylase ‘Dessau’. Wien Med Wochenschr 1997; 147: 347-50. Menzel EJ, Farr C. Hyaluronidase and its substrate hyaluronan: Biochemistry, biological activities and therapeutic uses. Cancer Lett 1998; 131: 3-7. Akhtar MS, Bhakuni V. Streptococcus pneumoniae hyaluronate lyase: An overview. Current Sci 2004; 86: 285-9. Duran RF. Studies on a certain spreading factor existing in bacteria and its significance for bacterial invasiveness. J Exp Med 1933; 58: 161-63. Buchanan RE, Gibbons NE. Bergey's manual of determinative bacteriology. 9th ed. MD: The Williams and Wilkins Co., 1994; pp. 532-7. McClean D. The capsulation of streptococci and its relation to diffusion factor (hyaluronidase). J Path Bact 1941; 53: 13-6. Tam YC, Chan ECS. Modifications enhancing reproducibility and sensitivity in the turbidimetric assay of hyaluronidase. J Microbiol Methods 1983; 1: 255-60. Godkar PB, Godkar DP. Text book of medical laboratory techniques. 2nd ed. Mumbai: Bhalani Publishing House, 2003; pp. 570-1. Dorfman A. Methods in enzymology. Vol. I. New York: Academic Press, 1955; pp. 166-9. Collee JG, Fraser AG, Marmion BP, Simmons A. McCkie and McCartney practical medical microbiology. 14th ed. New York: Churchill Livingstone, 1969; pp. 191-5. Salle AJ. Laboratory manual of fundamental principles of bacteriology. 3rd ed. London: McGraw-Hill Book Company, 1948; pp. 79-86. McClean D, Rogers HJ, Williams BW, Hale CW. Early diagnosis of wound infection. Lancet 1943: 1: 355-62. Russell, Barbara, Sherwood NP. Studies on Streptococci II. The role of hyaluronidase in experimental streptococcal infection. J Infect Diseases 1949; 84: 81-7. Pierce WA. Studies on hyaluronic acid-hyaluronidase system of hemolytic Streptococci. M. S. thesis. Wisconsin: University of Wisconsin, 1947. Smith RF, Willet NP. Rapid plate method for screening hyaluronidase and chondroitin sulfatase producing microorganisms. Appl Microbiol 1968; 16: 1434-7. Puhvel SM, Reisner RM. The production of hyaluronidase (hyaluronate lyase) by Corynebac-terium acnes. J Invest Dermatol 1972; 58: 66-9.